Intriguing findings from the University of North Carolina give moms and moms-to-be another reason to hop on the BPA-free bandwagon if they haven’t already. The study linked a child’s exposure to this industrial chemical in the womb and early in life to high levels of anxiety later in life. 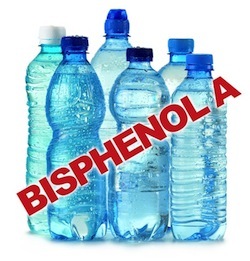 BPA, short for Bisphenol-A, is a chemical which was approved by the FDA in the 1960s for use in the production of plastic products such as water bottles and infant bottles, as well as the inside lining of food and infant formula cans. One of the reasons it has been highly publicized in recent years is due to the results of a large national survey (NHANES III) conducted by the Centers for Disease Control which found detectable levels of the chemical in 93% of 2,517 urine samples tested for people six years and older. When such a large percentage of the population is exposed to a chemical, it raises concern regarding the effects that this unnatural substance may impart upon human health. The National Toxicology Program as well as The Food and Drug Administration have become concerned about the effects of BPA on the brain, behavior, and prostate gland of fetuses, infants, and children. These age groups are at the highest risk of experiencing detrimental effects of BPA exposure as their bodies are early in development and cannot easily detoxify chemicals. Research is currently being conducted to test the health effects of BPA, with the most recent study showing interesting findings. Researchers exposed a group of rats to low doses of Bisphenol A (BPA) throughout gestation, lactation, and puberty. These rats exhibited significantly higher levels of anxiety later in life than rats that were not exposed to the chemical. The researchers found that BPA changed how genes were expressed in a part of the brain called the amygdala- a region of the brain associated with the control of fear and stress. The BPA seemed to affect the release of oxytocin, a hormone that has been linked to social behavior, thus explaining why the rats demonstrated increased anxiety. There was hope for some of the exposed rats, though, as researchers fed one group a diet rich in soy which seemed to mitigate the effects of the BPA. Phytoestrogens in soy products affect hormones in a way that blocked the effects of the BPA, but how exactly the effects of BPA was blunted is unclear. More studies need to be done in this area, so it’s not recommended to consume a “high soy” diet to counteract the effects of BPA exposure. Though soy is part of a heart healthy diet, too much of anything- good or bad, could have undesirable health effects. The best thing to do while pregnant or breastfeeding to reduce a fetus’s or infant’s exposure to this questionable chemical is to avoid drinking or eating from BPA-containing products. By following the FDA’s guidelines below, you can ensure your child will be BPA- and maybe anxiety - free. Don’t microwave polycarbonate plastic food containers. Polycarbonate is strong and durable, but over time it may break down from overuse at high temperatures. Use glass, porcelain or stainless steel containers for hot foods and liquids instead. Reduce your use of canned foods, which may be lined with BPA. If a product doesn’t say “BPA-free,” keep in mind most aluminum cans or bottles have linings that contain BPA. Steel bottles or cans, on the other hand, do not contain BPA. Polycarbonate plastic is generally hard, clear, lightweight plastic and often has the No. 7 recycling symbol on the bottom. Avoid plastic containers with the recycle codes 3 or 7 on the bottom, which may be made with BPA.